Even if they don’t look the part, white actors usually do not have to defend being chosen for their roles — as Zoë Saldana is being forced to do for her starring role in the new Nina Simone biopic. The tall and glamorous Faye Dunaway and Warren Beatty were hardly dead ringers for the short and ordinary Bonnie Parker and Clyde Barrow, but 1967’s “Bonnie and Clyde” marked a turning point in American movies. Leonardo DiCaprio might date far fewer models if he looked anything like J. Edgar Hoover. He still got the part in 2011’s “J. Edgar” and a Golden Globe nomination to match. Few people who saw “My Week with Marilyn” that same year would say Michelle Williams resembled Marilyn Monroe; yet that didn’t stop her from winning a Golden Globe for the role. Actors of color, particularly women, are another matter. Diana Ross drew a similar reaction for playing Billie Holiday in 1972’s “Lady Sings the Blues.” She looked and sounded nothing like Holiday. Nevertheless, Ross won an Oscar nomination. Sometimes we pull down our brothers and sisters before they’re even allowed to show they can fly. The Nina Simone biopic has already endured years of controversy. With that announcement, detractors began to sharpen their pitchforks. Simone resembled Aunt Sarah in “Four Women,” whose “skin is black.” Saldana looked more like Sweet Thing, who says, “My skin is tan; my hair is fine.” The people against the black Latina’s casting did not want Sweet Thing to play Aunt Sarah. 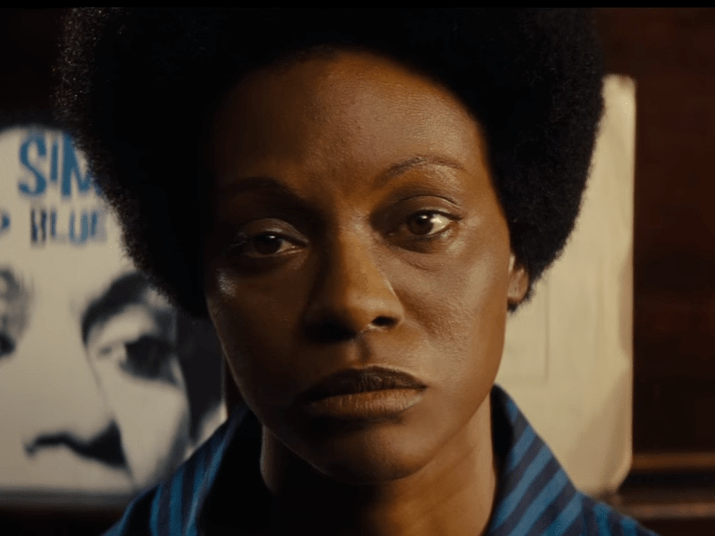 Nina Simone fans object to Zoë Saldana being cast with makeup to darken her skin and a prosthetic nose as shown in this still from the trailer. In March, the trailer for the film was released. It showed Saldana wearing makeup to darken her skin and a prosthetic nose. But she still didn’t resemble Aunt Sarah. Now critics have lit their torches and unleashed the hounds. Before seeing the film, the social media mob wanted to tweet Saldana off the project. USAToday.com, BuzzFeed.com and other sites collected some of the harsher tweets. People lobbed words like “offensive,” “horrible” and “blackface” as if they were grenades. In an interview with Time magazine, Simone’s daughter, Lisa Simone Kelly, stressed that, despite her problems with Saldana in the role, the blame should not fall on her. “It’s unfortunate that Zoë Saldana is being attacked so viciously when she is someone who is part of a larger picture,” Simone Kelly said. That picture is often framed by questions of authenticity and historical accuracy. In recent years, films like “Argo,” “Zero Dark Thirty” and “Selma” came under fire from critics for distorting history. “Nina” poses a different question rarely aimed at white actors like DiCaprio: Does the actor look like the person she is playing? Yet her career proves more notable than those words. Virtually alone among black actresses, Zoë Saldana’s career equals many of her white peers. From “Drumline” to “Star Trek,” we’ve seen Saldana grow up on screen. She’s been “The Girl” in movies with predominantly black casts (“Takers”) and integrated casts (“The Losers”). From summer blockbusters to indie fare, dishing out death in “Columbiana” to laughs in “Death at a Funeral,” Saldana’s resume matches and even exceeds white actresses around her age, like Julia Stiles, Katherine Heigl or Rachel McAdams. All that’s missing on her resume is a role that could put her in the company of serious performers. “Nina” could be that role. 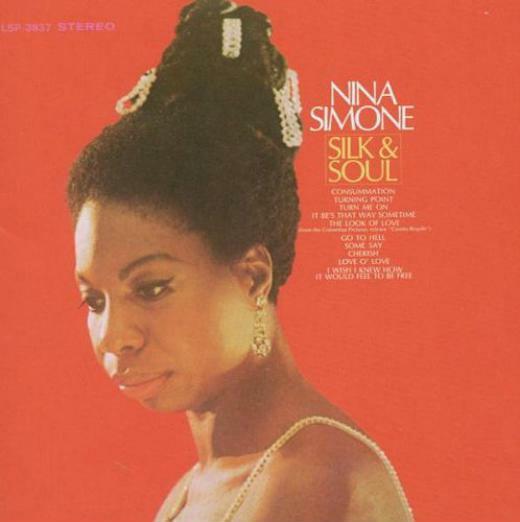 The cover of Nina Simone’s “Silk & Soul” album. To flip a famous Chris Rock refrain, just because I understand, doesn’t mean it’s right. Stories about minorities rarely get told. When they are, white filmmakers often get to put in or leave out whatever they think will sell. Will “Nina” — whose director and writer, Cynthia Mort, producers and casting director are all white — give Simone her due? Will their film even hint at how Simone’s unapologetic blackness breathed life into her art even as it upset social sensibilities? Will “Nina” see Nina as beautiful? “There is something deeply shameful — and hurtful — in the fact that even today a young Nina Simone would have a hard time being cast in her own biopic,” he says. “In the context of the politics of race in America and the politics of race in the entertainment industry in America, to make a movie about a person like that and cast an actress that has to wear blackface and a prosthetic nose is tone-deaf,” Arie said. If that glory has been compromised with “Nina,” it won’t be the last time. The almighty dollar will always trump authenticity. Consequently, I believe black people should use our dollars to support young actresses like Oduye and movies like “Pariah,” which despite critical acclaim grossed only about $750,000. Instead of flogging Saldana, we can embrace her desire to play the best roles she’s offered. More important, we can work harder to embrace women who look like Oduye and Simone — in the movies and in our own communities. Marc Rivers is the arts and entertainment critic for TruthBeTold.news and writes the Big Brotha column.